Meniga was the only PFM white-label solution provider demoing at Finovate Europe 2012. Their CEO talked us through their new concept of “peace of mind banking” based on leveraging gamification and driving social curiosity, with a PFM service fully integrated to online banking. A couple of weeks ago, I covered Finovate Europe 2012 live on the Visible Banking blog. 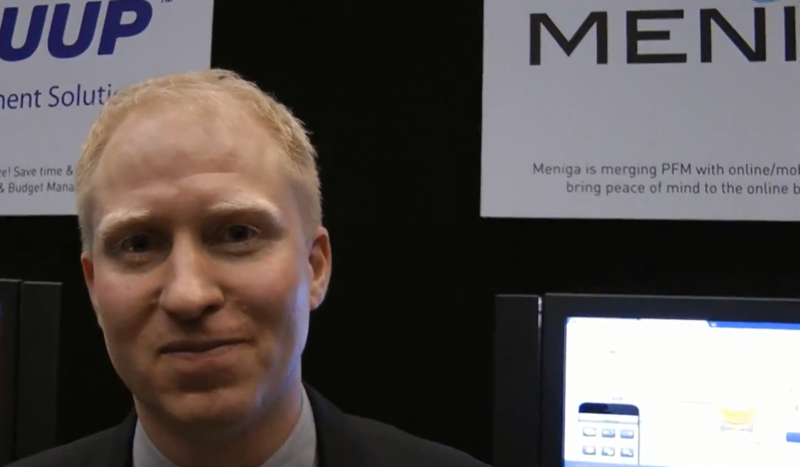 During one of the short breaks, I managed to record a short interview with Meniga, one of the few Personal Finance Management (PFM) solution providers to demo at this year event. This year we can’t say that one specifc trend stood out at the finovate Europe show. Nevertheless, we noticed that two of the usually over-crowded areas of digital finance innovation were not the focus of the show: mobile and PFM. Meniga demoed its latest features focused on gamification and a deeper online banking integration. They are also advocating the use of PFM more deeply integrated within online banking over and beyond the simple ‘tab’ feature. I invite you to watch my short video with Georg Ludviksson – Co-Founder & CEO.